Home Basketball Courts are Simple, Right? Okay, I know the "One Does Not Simply ... " statement has become cliché, but it really is true when it comes to home basketball courts. Budget, backboard size, and system features are some of the considerations you will want to review before you purchase, that is if you want to get it right the first time. Take a look below. How much is this really going to set me back? Hey, lighten up a bit! 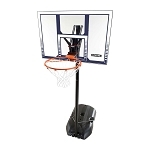 You are shopping for basketball systems for your home basketball court. Michael Jordan has one of those, remember? 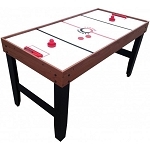 Granted his is indoors, has NBA regulation measurements, has a hardwood floor, and probably cost hundreds of thousands of dollars to make, but still. Your basketball court can be awesome too. If you are looking to have a single basket, typical of a front yard driveway or a small backyard set up, a purchase price for the system can range from the low $100's to over $2,000. I will help narrow that down for you in a moment. For larger backyard sport courts, you can double that cost, noting that you will likely not be purchasing in the lower product price range. From there, what kind of playing experience are you wanting? For a professional feel - like what one would experience if one went by the name of Lebron James - a tempered glass backboard is a must. That puts you into the upper price range of basketball systems with a minimum price of around $550 for a single basketball system. While other materials - acrylic, polycarbonate, and polyethylene plastic - are going to put you in the lower price range, typically under $450. Besides the basketball system cost, you will also incur a cost of installation, whether you hire someone to help, or you do it yourself. The larger the system - pole and backboard - the larger the hole you will need to dig and the more cement you will need for your footing. Keep that in mind while you are drawing up your budget. Speaking of backboard size, let's next try to make sure your basketball court does not look weird. Some people will think of setting up a basketball court and want to go the cheapest route possible with their basketball systems while building a regulation-sized basketball court in the backyard. Going small on your backboard with so much court space is like winning the lottery and then purchasing a 1988 civic. "Go big or go home" the saying goes and so it is with lots of court space and your backboard size. The opposite is also true. Getting a big backboard for a small basketball court is like building a mansion in a trailer park. As a general rule, for a typical 2-4 car driveway, do not go bigger than 54-inches. 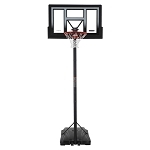 For a backyard court with a decent amount of space - does it have a 3-point line all around the key for instance - do not go smaller than a 54-inch backboard. 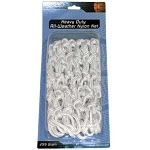 Now, is your basketball court going to be ruined because your backboard is too small or too big for the court size? No, but you don't want your friends to see a weird looking basketball court at your house, do you? Well, do you? We will wrap this up with the features you may want on your basketball system. It has a backboard, a rim, and a net, but what else does it do? This might sound unimportant, but the features of your basketball system can really affect the whole basketball court experience you are trying to set up. For instance, a basketball system that has a rim height fixed at 10-feet is not going to be a whole lot of fun for your 8-year old son unless your son is Dwight Howard. 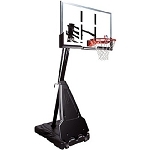 Features you may want to look for is height adjustability, a breakaway rim, and backboard to pole clearance. To illustrate this further, a highly competitive person that wants highly competitive basketball players frequently playing a highly competitive basketball game on a large backyard basketball court may want a fixed-height basketball backboard with a breakaway rim with maximum pole to backboard clearance. Whereas, a family wanting just to be able to go shoot some hoops in a casual setting with their kids ages 8 to 16 in their driveway may want a height-adjustable backboard, whatever rim the system comes with, and less pole to backboard clearance so they have more space to shoot. Well, you are all set. You are going to be the envy of the neighborhood. Time to get your game on. Haha, funny title! I don't have a home basketball court, nor do I desire one, but I have always been curious as to how those work. Insightful post!